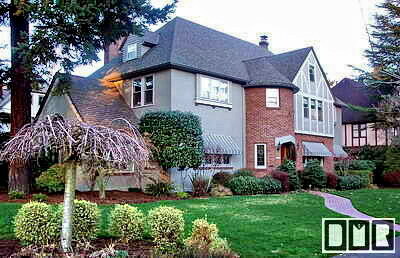 This house is in West Linn Oregon. 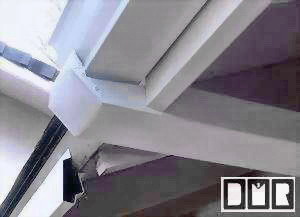 The center 'U' shaped white pre-painted gutter section was formed out of a single gutter, and installed after it was fabricated. 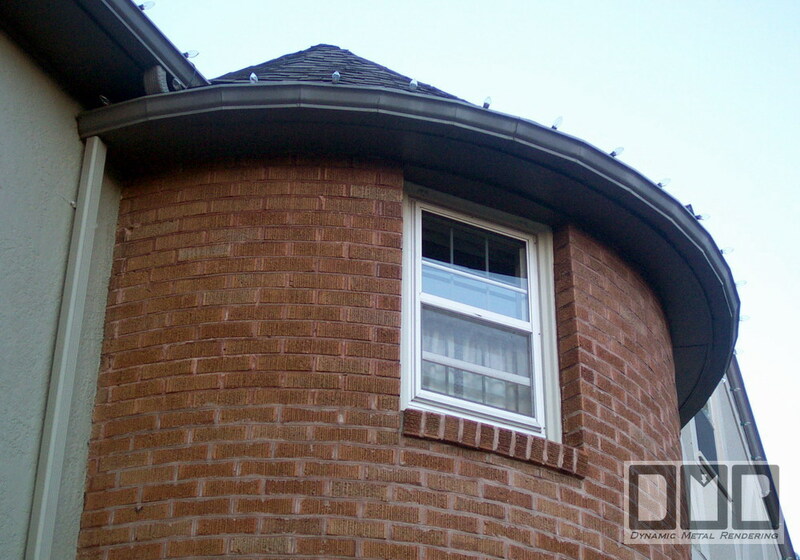 We then installed the one to the upper right, and sealed the corner with the first gutter. It has the large size no-clog 'B' style elbow there to the left. 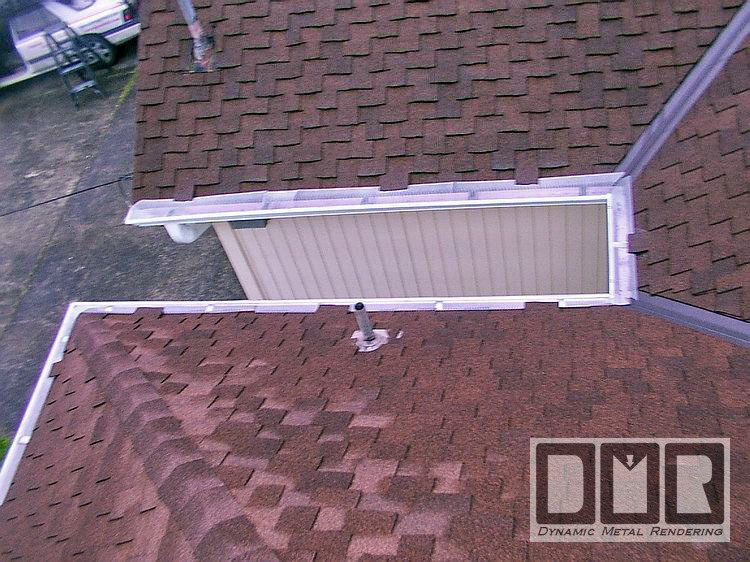 This picture below is a shot from up on the left side of the roof, looking down at an angle. The galvanized steel screens are installed. I have tabs of the roofing shingles lapping over the screen here and there to make sure it does not blow open. 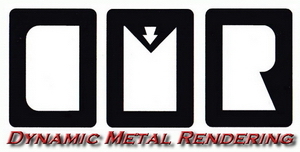 I have since found a better screen product that is a thicker and heavier metal and is pre-painted in a black powder bake finish, so it is a lot less conspicuous looking. It also comes in wider 4' sections, so there are fewer gaps. It also comes with three hinge clips per screen, instead of only two. This is a custom aluminum catcher basin to catch the rain water from a narrow valley. 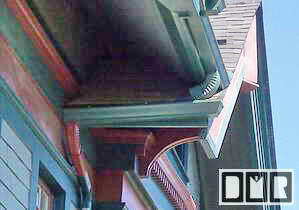 It was made from a straight 3' gutter, with each end mitered, instead of just slapping on a pair of end-caps. 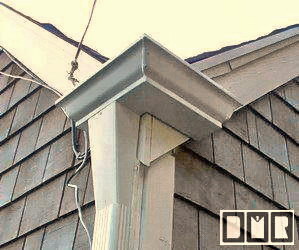 It has a 3.5" x 4.5" funnel mounted in the bottom as the outlet, reducing into a standard size downspout going straight down the corner of the house. 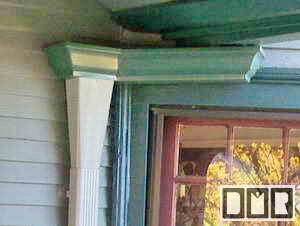 This is a custom aluminum catcher basin to catch the rain water from a gutter over it that is on the front porch roof. The gutter above has a rather custom end, since it met with the wall at a 45 degree angle, but that was hard to photograph. 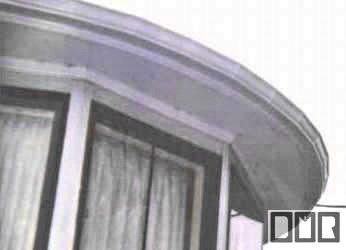 To the left of the upper gutter is the custom fascia board and soffit I had to make to mount the gutter on (see our Custom Fascia web page for more details). 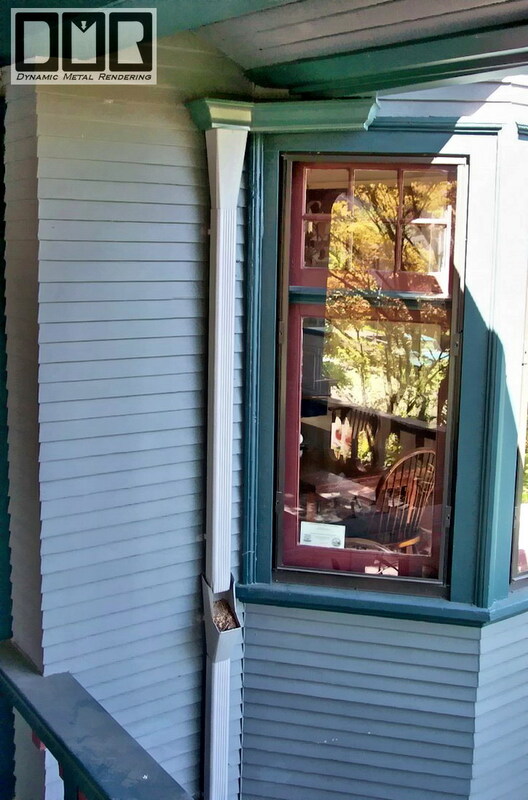 If I had installed a simple downspout elbow under the gutter, just like it was with the old gutters, that elbow would have covered the corner of the window. 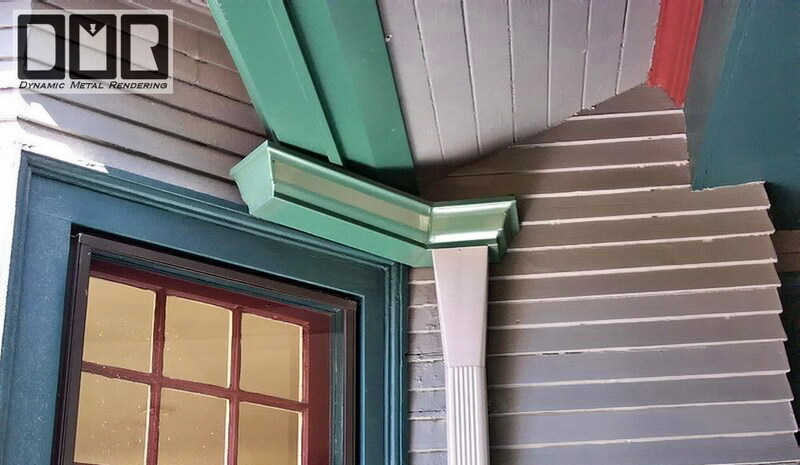 Again, it was made from a straight 3' forest green pre-painted aluminum gutter, with each end mitered, instead of just slapping on a pair of end-caps. It also has a 3.5" x 4.5" pre-painted colonial gray funnel mounted in the bottom as the outlet, to minimize the possibility that it would ever clog up. 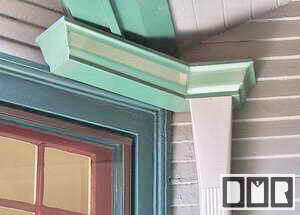 To the right is the custom basin for the other side of the door way that matches the left one shown above. 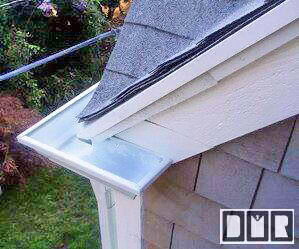 The lower gutter will not be getting much of any rain water in it other than from the downspout elbow of the upper gutter. 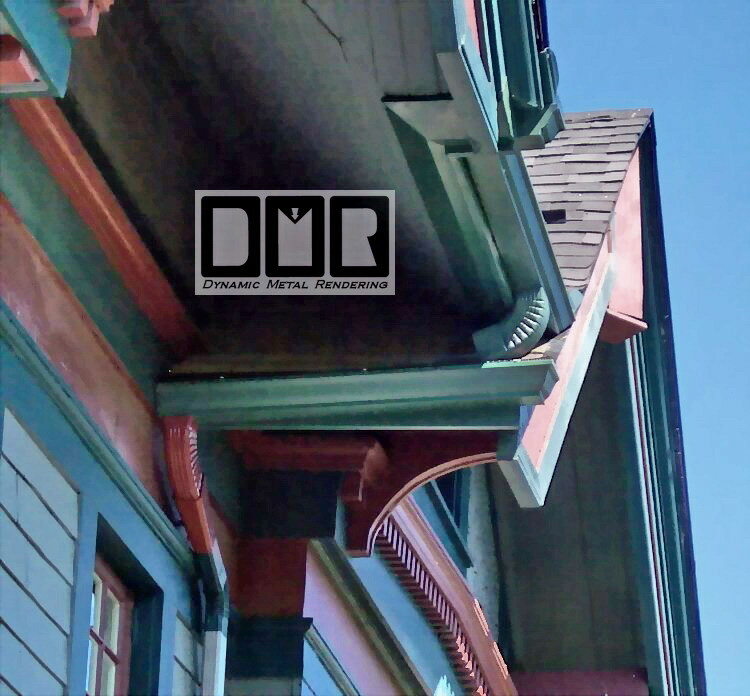 We just felt that putting a gutter there instead of having the downspout continue to the siding would look better, and more like it was meant for this house. 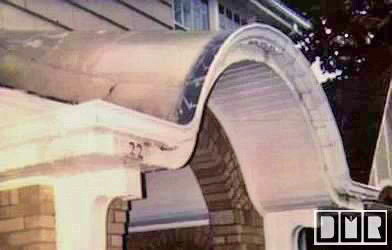 The lower gutter looks very out of wack, but the eaves sag a lot, even though it has a hefty knee brace to hold it up. 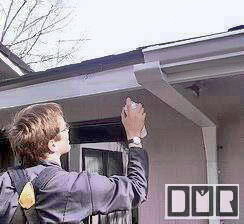 that is what we had to do to make the gutter level so there would be no standing water in the gutter. 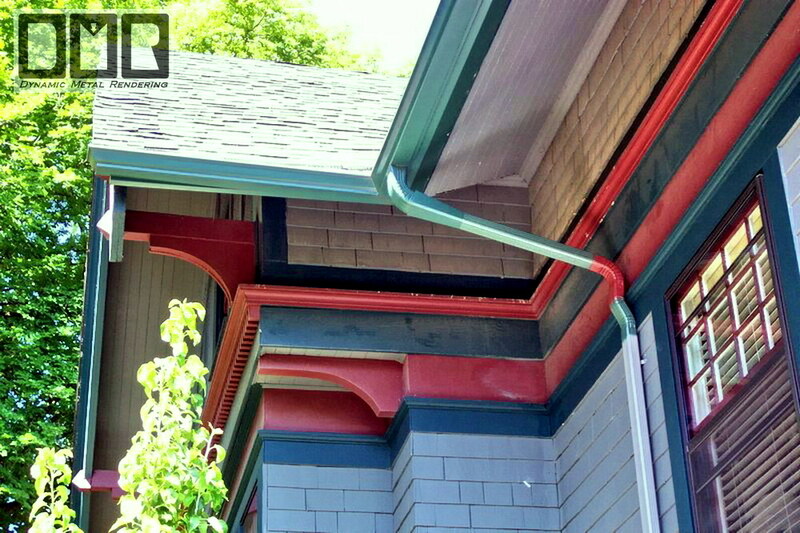 It would be great if gutters did not need downspouts, but that is not a reality we are likely to see in the future. 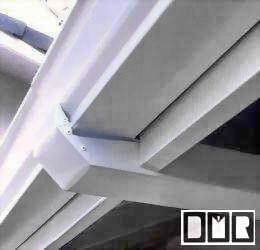 This photo shows some of what we will do to try and make gutters and downspouts look right on the houses we service. 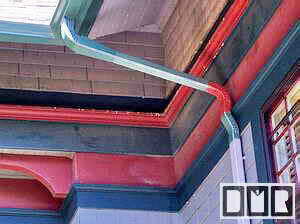 As well as matching the colors of this three tone paint job, it shows the larger elbow just under the gutter, for the no-clog outlet, and the reducer that converts it to a standard size downspout. 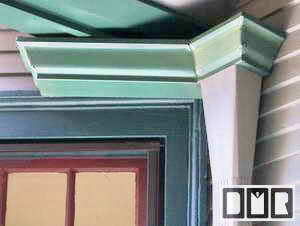 It also shows the special elbows we use to form the downspout over the intricate wood molding, instead of chopping into that wood molding, like we have seen other contractors do. 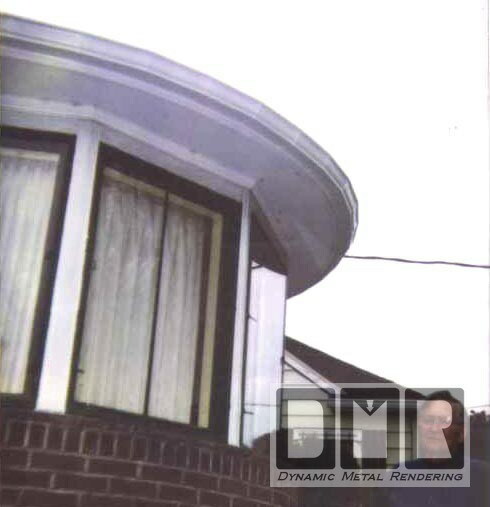 This roof on the back porch was very low, so the bottom of the aluminum fascia (that I also made for this house) is even lower, so a normal elbow would have been so low that an average person could bump their head on it. 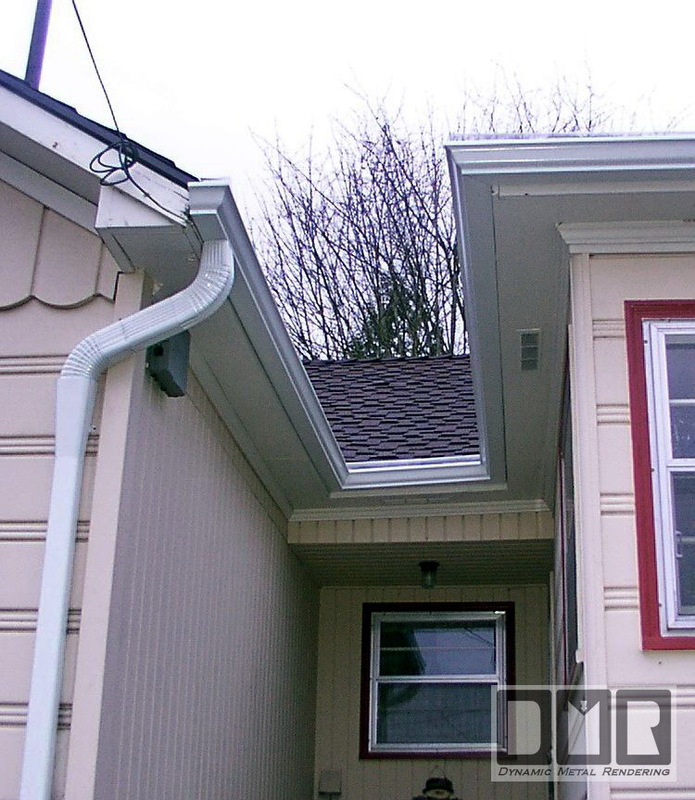 This means that the downspout pipe to the siding would be even lower than that. 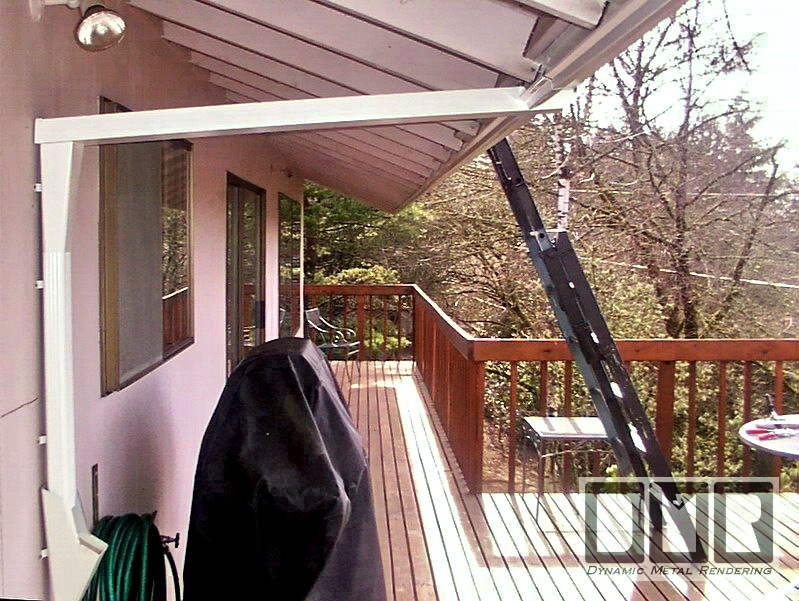 This is a custom aluminum catcher basin to catch the rain water from a gutter over it that is on this low back patio roof and transfer the rain water back to the siding, while maintaining a good headroom area. You can see here how low the clearance was with me just standing on the back deck. Our client I had not even mention this as a problem she had. 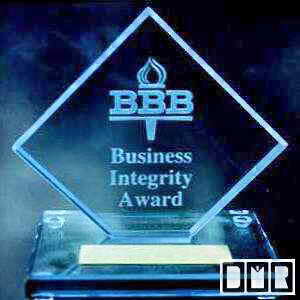 She assumed there was no remedy, since with any other contractor that would be true. 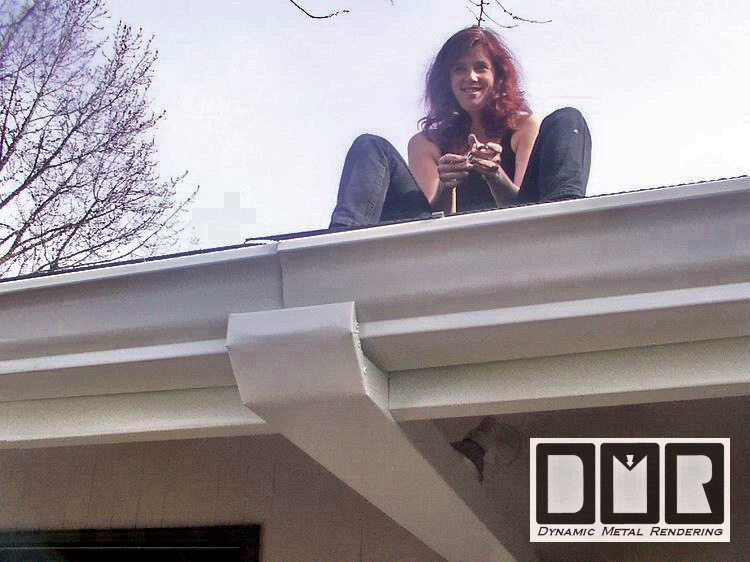 I knew it would have been an area that she and her guests would simply have to avoid, so on my own initiative, I brainstormed a way to fabricate a custom channel to get the rain water to the siding without loosing much headroom. I managed to keep this channel above 6 feet, even near the wall. I left the top side open, since it had such a slight grade to the siding, so it was much less likely to jam-up and it can be cleaned out if needed. 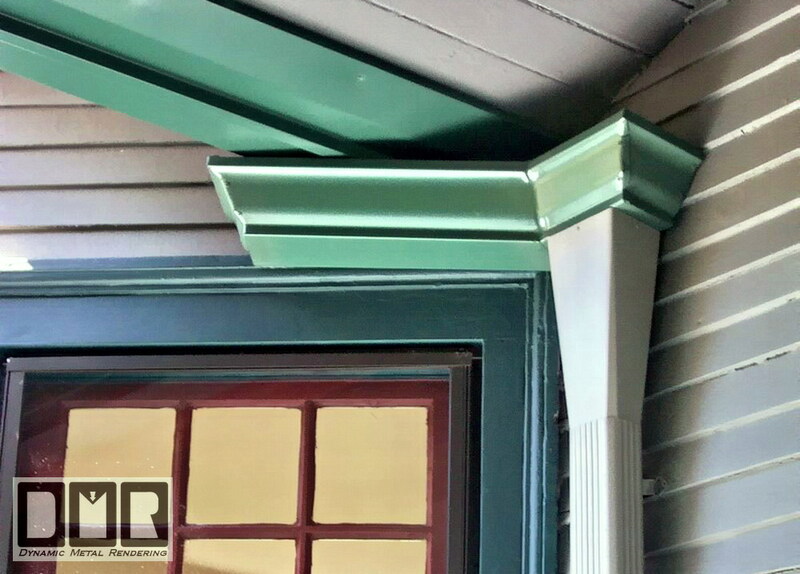 This gutter was also too long to leave in one piece, so this was the best place to split it up to allow for expansion and contraction that is different than the wood structure. 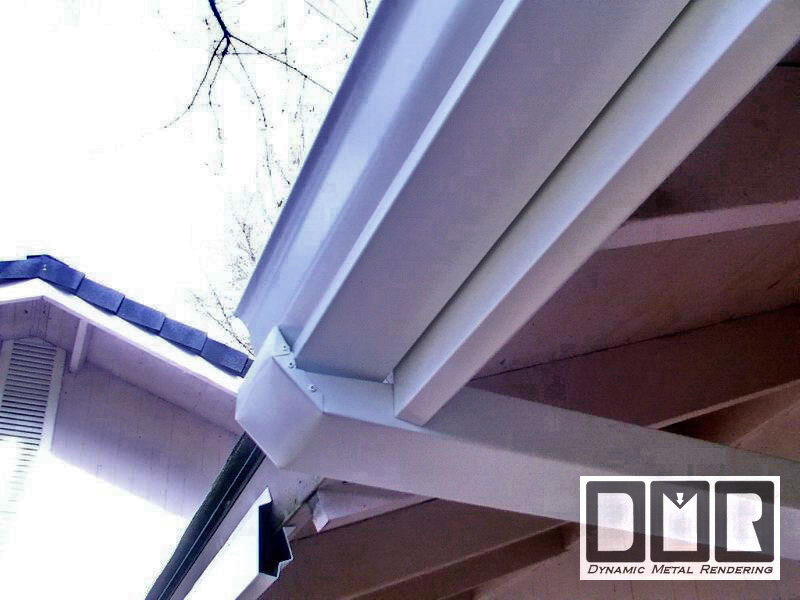 As you can see in these photos, the two gutters have a small overlap and simply dump into this custom fit tray. 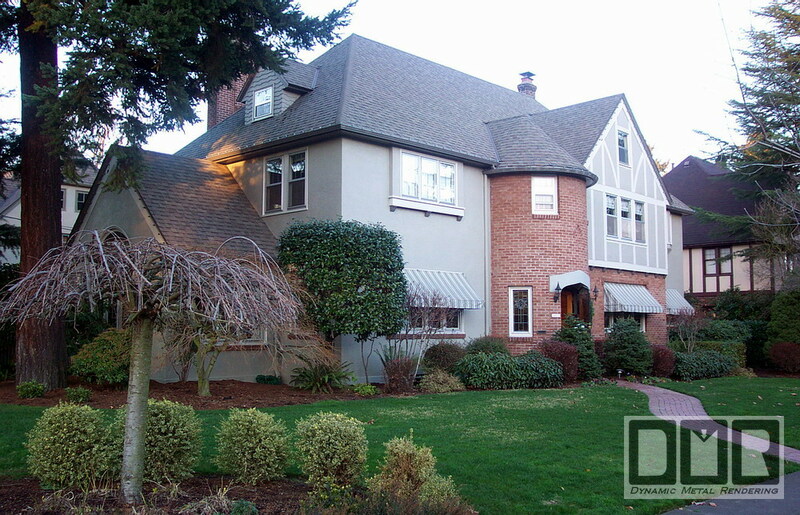 (see our Custom Fascia web page for more details of this fascia work). 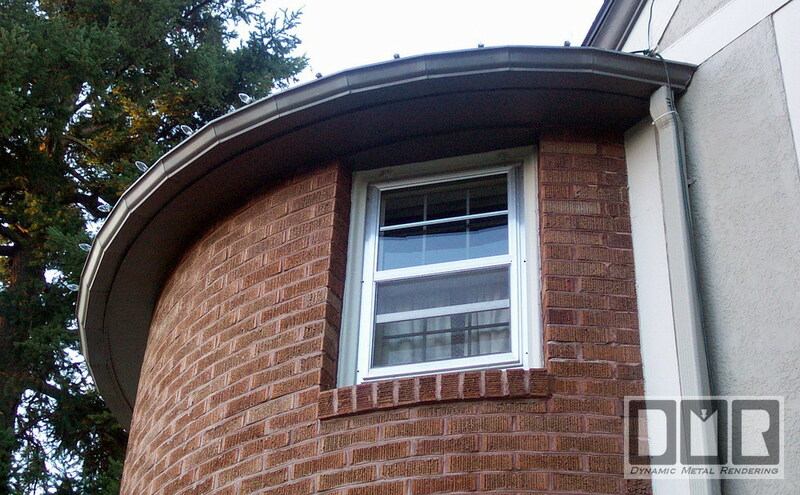 This is another custom curved gutter fabrication we did back in 1996 for a client on the NE corner of 3011 NE Thompson in Portland, Oregon. But these pictures were taken in late December of 2004, some 8+ years later. They had an unusual situation here as well, but without hesitation, we were up for the challenge. From what we have seen around this city, we think we did quite well. We have seen several worse jobs done, and none that were done better. It has about a 13.5' diagonal span. 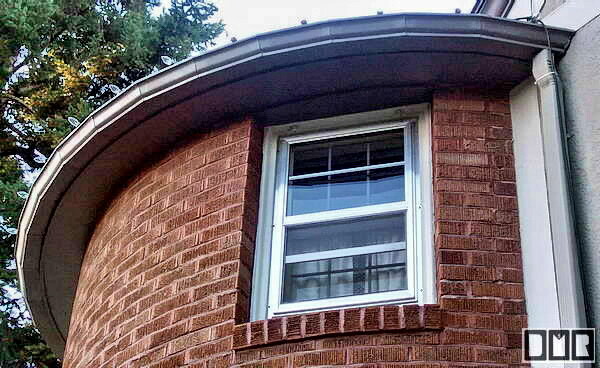 We made this curved gutter from these 2 sections with cuts every 1 foot of that gutter, and seal it up together. 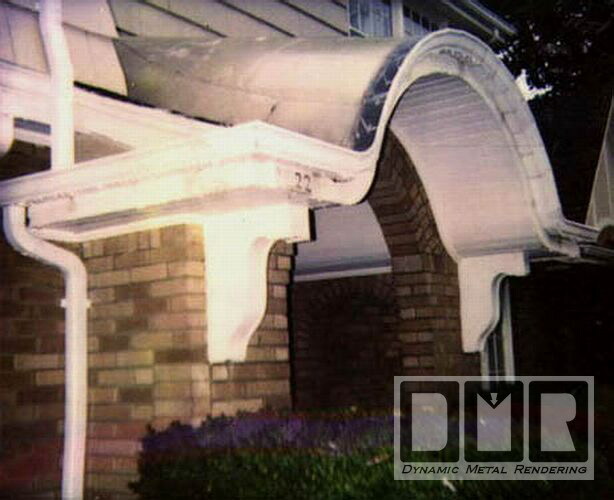 Here is the first curved gutter we fabricated back in 1994. It has about a 13 foot diameter in a full half circle. 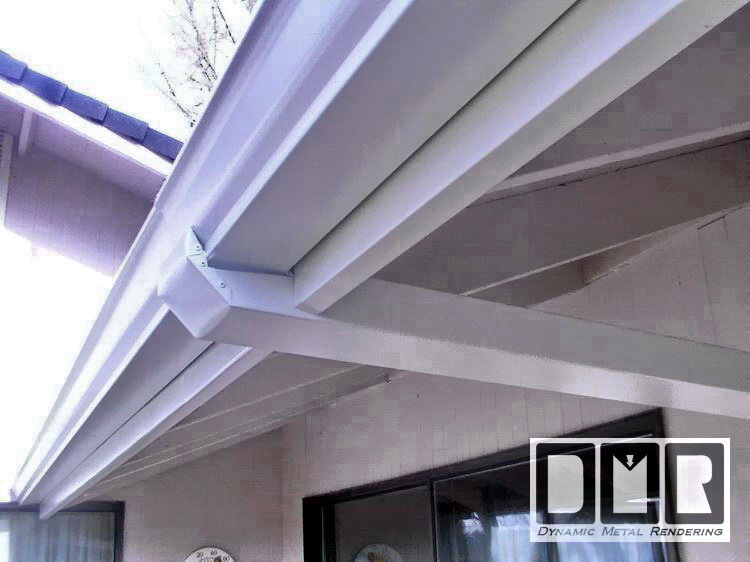 It was to replace a new gutter that the General Contractor, had gotten installed by a different gutter contractor. 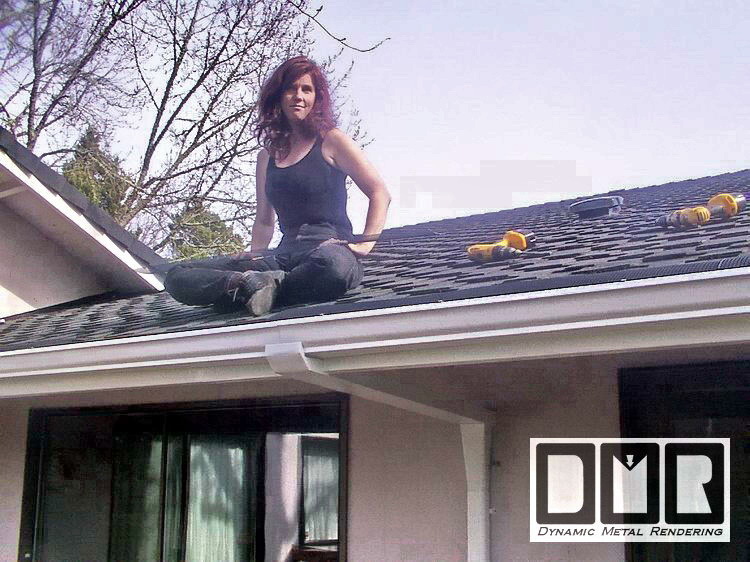 The homeowner was not satisfied with the first attempt and pressed the General contractor to find a different installer to replace it. He described the first new gutter as looking like a tank tread. The homeowner was pleased by my work you see here. It is not the clearest picture, taken from a Polaroid snap shot. I think they were about 9" sections each, all sealed to one another to form a gutter that would wrap around this section of the house. 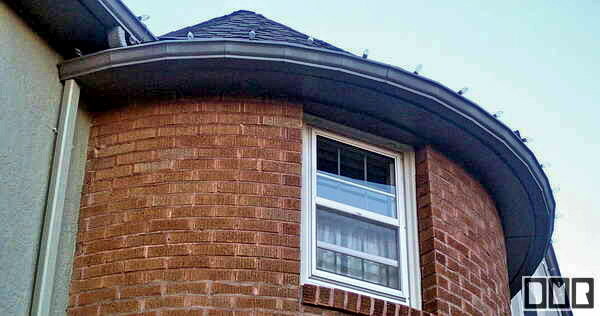 There is no way to form a continuous gutter like this. 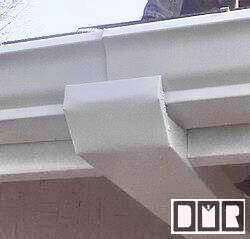 This is a custom gutter I needed to do in 1995 on a client's house at the base of Mt. Tabor on the corner of 60th SE Main St., Portland, Oregon. 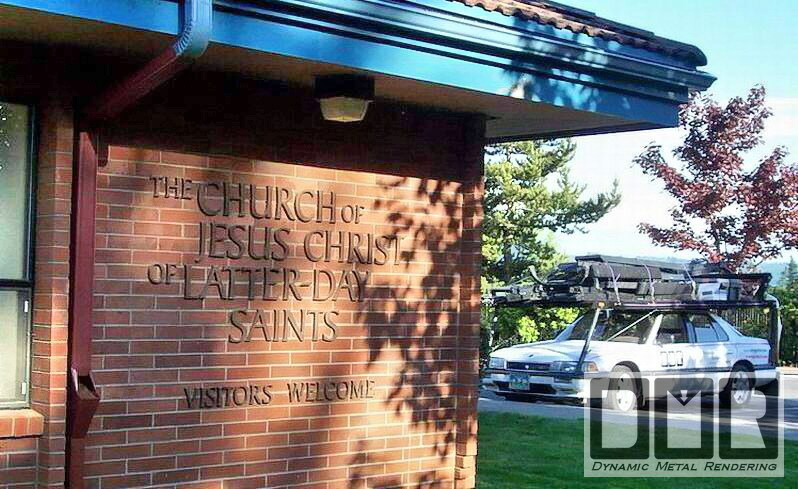 They had an unusual situation on the front entry. 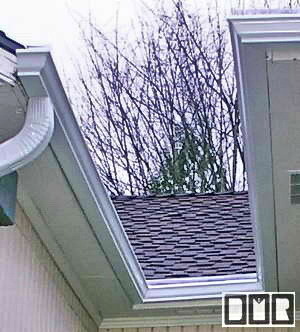 This was one of the trickiest gutters I had to fabricate and install. Again, it is not the clearest picture, taken from a Polaroid snap shot and scanned in.